TROYES is designed by Xavier Georges who created Royal Palace and Carson City – both of which I like a lot, especially the latter. 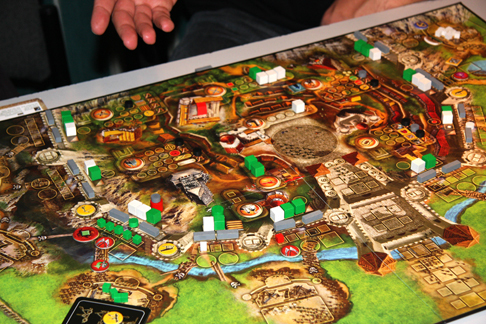 Troyes is a city building game using dice – it sounds like players use a central pool of dice but can also buy them off of each other too. Players have secret agendas too. Definitely one I have to try and/or buy. STRONGHOLD: UNDEAD is an expansion for Stronghold and itsounds like there is an undead army storming the walls of the castle instead of the goblins, orcs and trolls. One big difference sounds like there is no glory points this time – purely the task of breaking into the stronghold before 8 game turns are up. The glory points of the original game were an interesting system but people I have played with (and myself) found the amounts of them required to win meant it was very difficult for the invader to win after turn 6 (out of 10). So, a straight break-in or not with a new type of army sounds great. I’m really looking forwards to trying these at Essen and I may even pre-order them. (Note to publishers out there: I’m much more likely to pre-order and buy a game without trying it first if the rules are available to read beforehand. Sure, reading a few rules can make me realise a game is not for me, but not having rules to read means I’m much less likely to pre-order it). 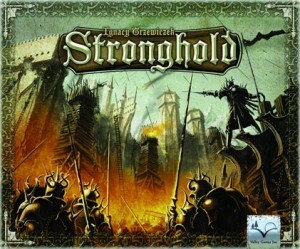 Please note that the Valley Games version of Stronghold (released March 2011) has massively updated rules to make them clear as the original rules were very confusing and had many conflicts. The defender has two heroes who enhance the troops at a wall. These are very useful, especially as they can not be killed. One can increase the strength of the units on a wall, and the other adds some strength and can kill an invader unit before the assault. Of course, both of these special effects cost hourglasses, but can make a big difference. Most of the pathways to the castle can have either a trap (placed by the defender and which will kill some specific enemy units if they use the path) or a bridge (placed by the invader and which mean no trap can be placed there). Once they are placed, they can not be undone and remain there for the game. These seem relatively small but, once laid, the paths and traps really start to define the battlefield. Obvious routes that the invaders troops will probably follow start to form and this starts to determine which walls will be the preferred targets. Stronghold is an epic game. It is filled with relatively simple options and decisions but there are lots of them and no definitive answer as to which will be right or wrong. The players act and then re-act to one another and there is little (or even no) downtime as play passes back and forth between invader and defender. Stronghold not only has a great setting but it also had a great pre-launch. The designer released over ten posts about how he came up with ideas and developed the game. This brilliant bit of marketing explained the game perfectly but was also very evocative. As a result, I pre-ordered it.